I think 2012 was the fastest summer in history. Cliché or not, I don’t know where that time went. It seems like it was June yesterday… and yet, there’s been lots of summer weather, lots of time at the park, lots of splashing and sand-playing, lots of ice cream. I know we did the whole thing. 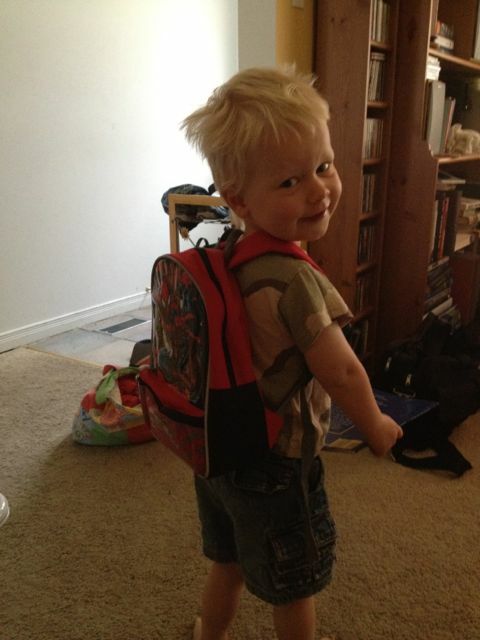 I can’t deny that it revolved in a large part around my little boy, who seems more and more grown up all the time. There’s no way I can call him a toddler anymore. Even his intonation is more worldly than it was a few months ago. 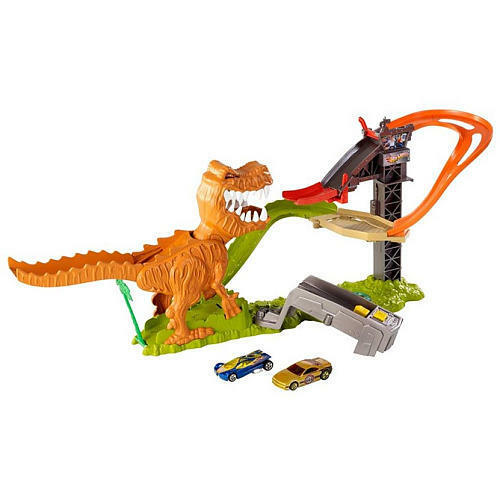 This three-year-old business is pretty fun. He’s learning to imagine, pretend, role-play, socialize. We’ve had some good times. 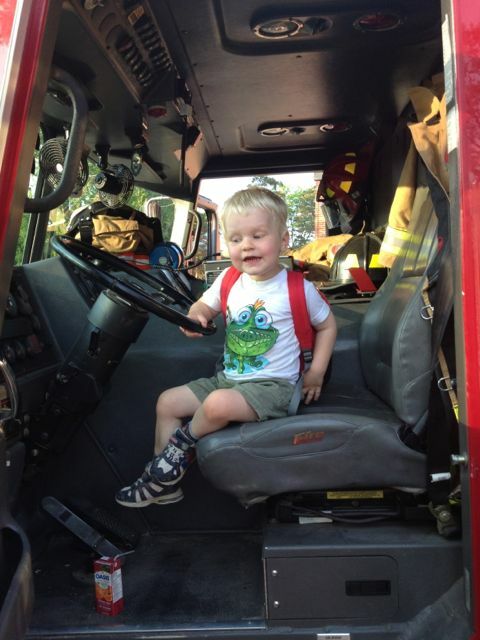 Back at the end of May, my school did their annual humongous barbecue fundraiser, and it was a big day for E, because he got to see a fire truck up close. Like, actually get inside it! You might notice that in that picture he is also wearing a backpack. It’s a Spider-Man backpack, brand-new that day; Daddy got it for him on clearance for $5, not realizing E would immediately be obsessed with it. It seems he had an unexpressed wish for a backpack, because when he’s at the babysitter’s he walks the other kids back and forth to school – the BIG kids – and they all have backpacks, of course. He was SO PROUD of that thing, and so adorable we could hardly stand it. Then there’s the ice cream. But only plain chocolate – he refuses to eat any ice cream with “food” in it (nuts, brownie pieces, marshmallows… NO FOOD!). 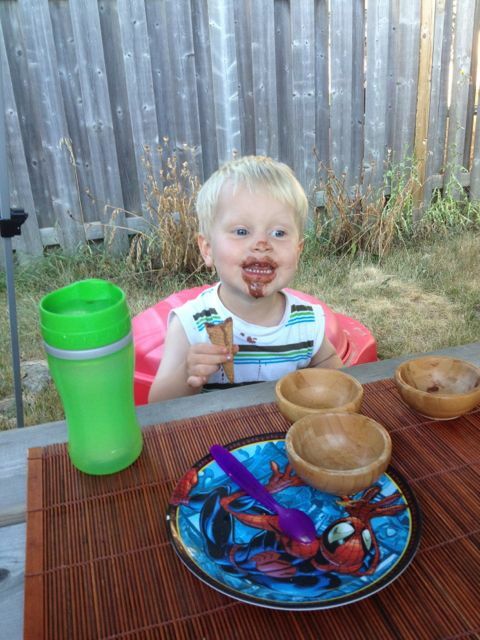 We’ve taken an embarrassing number of ice-cream-on-face pics from this summer… but hey, that’s our prerogative as parents, right? He looks rather debonair, no? and going for bike rides! 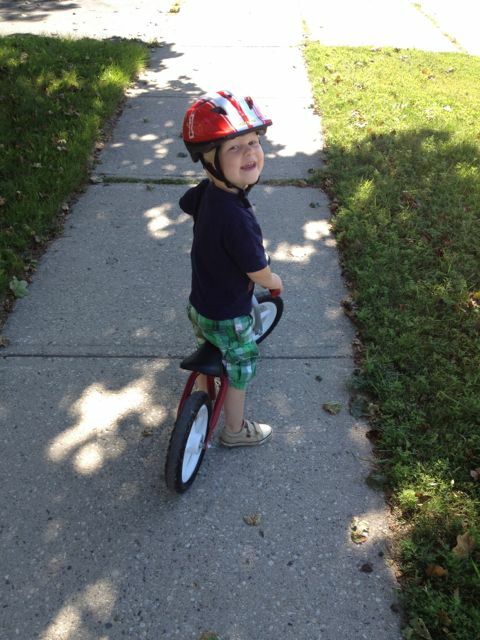 He has gotten so good at gliding along on his balance bike, it amazes me – and he’s also very good at being safe, proudly wearing his helmet, and stopping where he needs to stop (and waiting for Mama to waddle and catch up to him). He also enjoys his markers. He really wanted to use Daddy’s Sharpies, but we told him we would get him some washable markers that were okay for him to use. He was excited about that. As soon as he got them, he set off for the bathroom… to wash them. 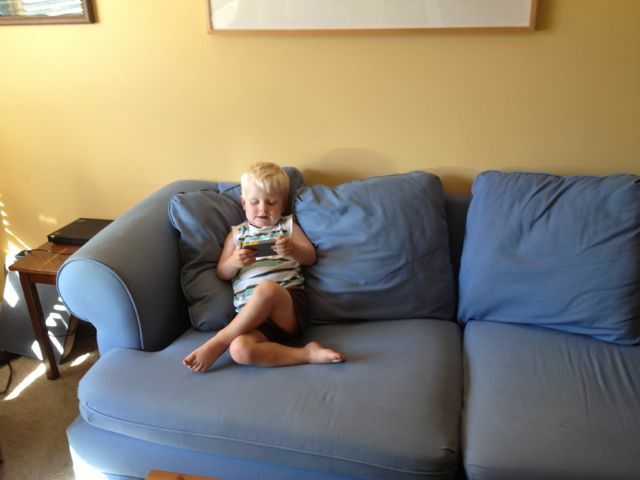 He has also been spending a lot of time “reading” to himself with his MeReader – another birthday present. In fact, he’s starting to memorize lines from the much-abridged Disney stories. I first realized this when we were at Family Camp, and I left him alone in the cabin for a moment. He said he would be fine, playing with his cars, but when I got back, he’d come outside: “I was worried that I didn’t see you, so I ventured out and wanted to find you.” Ventured out?? Turns this phraseology comes directly from his Winnie-the-Pooh book. I’ve also heard him use the word absurd, but I’m pretty sure he has almost no clue what it means. 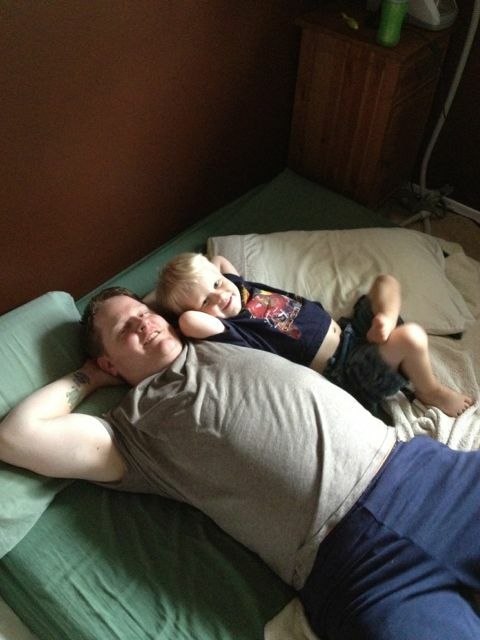 Oh, I almost forgot – he’s learned what chillin‘ is. The perfect summer activity. Wildly adorable! Those are great memories to capture. This summer really did fly by for us, too. A lot more quickly than normal. Maybe I was just loving it so much! These are so fun! I love “I don’t know when my heart wants to have fun” and using awkward. He’s such a smartie! Love Dilovely’s new look, too! Very sleek and lovely. Ah, “splendid” is from me! I remember how his eyes lit up the first time he heard me say it. We had a little discussion about how it’s several steps up from, say, “nice” or “good”, and I could just WATCH him internalize it. How does he fit it all in?? I probably coulda guessed that was you, if I’d tried. 🙂 You’re splendid. Ok, when we did “I beg to differ” I DID explain the meaning, with examples! If I say something and he asks what it means, I’ll tell him. Sometimes it works, sometimes it doesn’t. As for the summer, I admit the summer flew by. I REALLY enjoyed this summer – no courses this year for this teacher. We travelled West to visit family, attend a wedding reception in Alberta, and holidayed at the Hot Springs in Radium. In August, I deliberately had fun making quilt tops. I am not back at work, putting in my regular 12 hour days, but rethinking Mondays. I am not happy with how I have been treated with no respect by my government. Jan, ha ha, I know just what you mean! We have to resist talking about how light or dark it is in relation to sleeping – morning or night. Our latest sunsets around here are just after 9 pm, but it still makes bedtime tricky in the summer… and sometimes he wants to get up without enough sleep too, because it gets light so early in June. Good for you for enjoying your summer (I’ve always wanted to try quilting! ), and I’m glad you’re loving your job… too bad the political wrangling has to sour things so often. Sounds like you live in Ontario now? I meant to say “I am NOW back to work…putting in my 12 hour days. I am LOVING MY JOB this year, working in two different schools (alternating days)…. I AM NOT LOVING THE POLITICS, however. I DO not desire a wage increase (I am at the top of A3), but I want MY UNION to have the RIGHT TO NEGOTIATE on my behalf, NOT BE DICTATED TO…. Oh, my goodness. My favourites are “with its amazing paws” and “are you okay sleeping by yourself?” !!! (Shakes head with disbelief at how cute.) xoxoxoxoxo for you all. Awesome! He sounds like a British aristocrat! LOL! How much fun this stage seems! 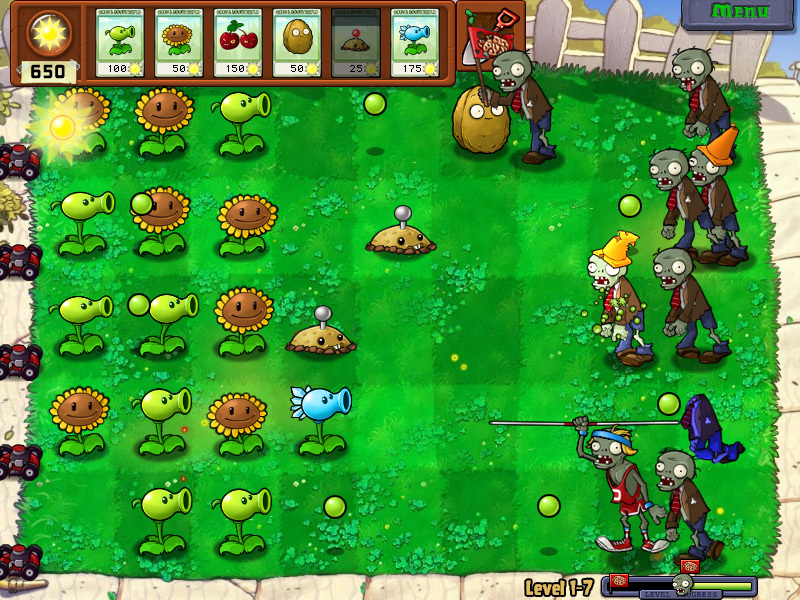 I am the ultimate Plants vs. Zombies player. Serious. I’m ridiculously good at that game.